Unit testing after the fact? We do just enough test-after development (TAD) to please our manager, and no more. Just Ship It! Once the business realizes they have product in hand, there's always pressure to move on to the next feature. Invariably, any "after the fact" process is given short shrift. This is why post-development code reviews don't reveal deep problems, and even if they do, we rarely go back and make the costly changes needed to truly fix the problems. This is why after-the-fact testers are always getting squeezed out of the narrow space between "done" software and delivery. My Sh*t Don't Stink. I just wrote my code, and it works. I know so because I deployed it, cranked up the server, and ran through the application to verify it. Why would I waste any more time building unit tests that I hope to never look at again? That Can't Possibly Break. Well, two-line methods and such. I can glance at those and think they look good. Lazy initialization? That couldn't break, could it? That's Gonna Be a Pain. Holy crud, that's a 100-line method with 3+ levels of nesting, complex conditionals, and exceptional conditions (test those? you're kidding). It's going to take me longer to write a reasonably comprehensive set of tests than it took to write the method in the first place. Worse, the method has numerous private dependencies on code that makes database or service calls. 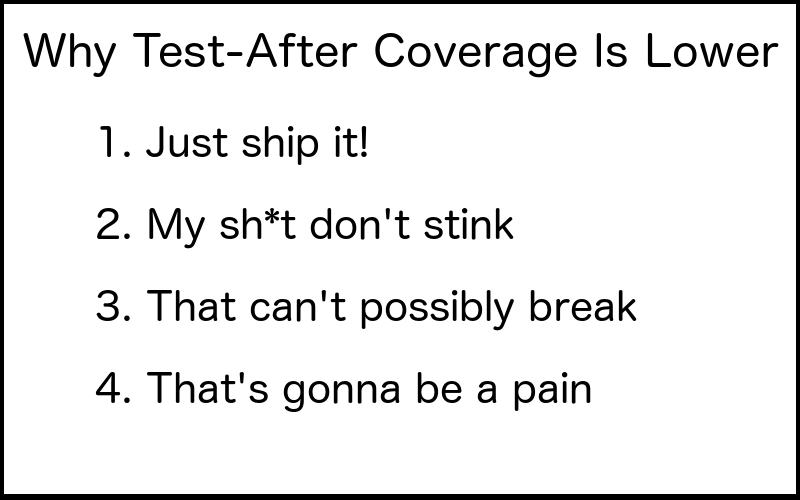 Or just dependencies that have nothing to do with what I'm testing. Just today I tried to instantiate a class, but failed because of a class two inheritance levels up with a dependency on another object being properly instantiated and configured. Figuring out how to test that is going to be a nightmare that eats up a lot of time. Code written without immediate and constant consideration for how to unit test it is going to be a lot harder to test. Most of us punt when efforts become too daunting. I hear that TAD coverage typically gets up to about 75% on average. Closer inspection reveals that this number is usually all over the map: 82% in one class, 38% in another, and so on. Even closer inspection reveals that classes with a coverage percent of, say, 38, often contain the riskiest (most complex) code. Why? Because they're the hardest to test. 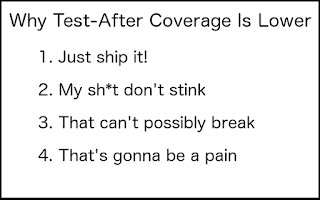 If I was allowed to only do TAD and not TDD, I'd scrap it and invest more in end-to-end testing.